Tis the season of goodwill, and all over the country banks are helping themselves to yours. Courtesy of the Direct Debit mandate they can ask for money from your account up to 3 days earlier than the date you set – thereby bouncing the payment and triggering a £35* fee. If you don’t believe me, read the small print and/or query it with your bank. I thought it was a fluke, the first January it happened to me, and I kept a more watchful eye on the account balance going forwards. Didn’t catch it the second year- again in January- but resolved it wouldn’t happen again. What’s the saying? –Once is chance, twice is coincidence, 3 times is enemy action. Right away, I cancelled all my direct debits. All but 2 of my bills have since been paid on payment plans or direct transfer, including water, electricity, council tax, and mobile phone. Paypoint has become my supplier of choice. By voting with my choice, I send a message to the banks that their behaviour is unacceptable. Many more think the banks are fine to carry on as they are. The singular advantage to retaking control is that I can postpone paying the bill until I know the money is in my account- I soon got the hang of it and it became low (but not zero) maintenance. For those on low incomes or benefits this is a crucial advantage, since even benefit income can be unpredictable. It’s bad enough to find yourself unexpectedly short- without having the additional burden of a £35* fee. * or whatever your bank charges for this service. May 2014 – purchased Del Prado kit. 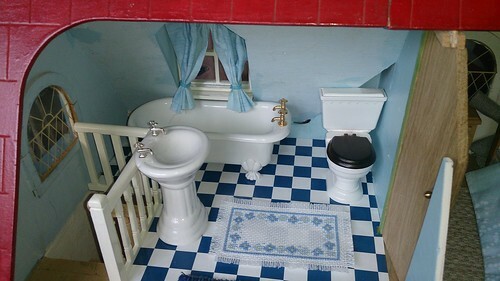 May 2014 I gambled £20 and bought a dolls house kit on ebay, on the premise that it was cheaper buying a bundle than spending out £5 a time for flooring paper, for the dollhouse I was renovating. I planned to cover my outlay by selling the bits I didn’t need, and keep some half decent flooring and maybe lights for my own project. Here’s how we did. This is my dolls house from 25 years ago which just fits on top of my wardrobe – my grandson spotted it last year. 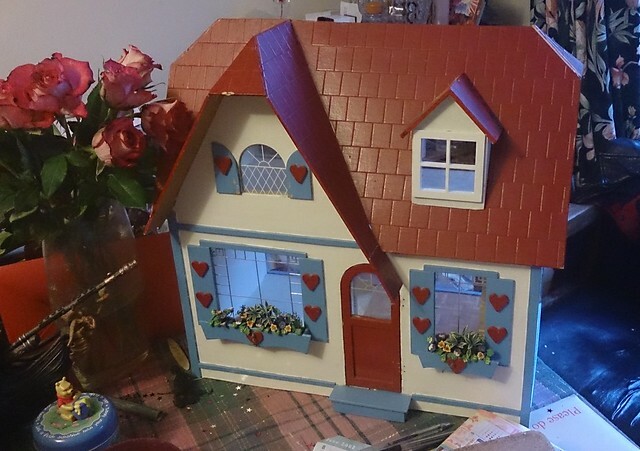 We had been refitting it for a new generation, tiny bits at a time as befits my miniscule budget, when I first noticed Del Prado Dolls House magazine. 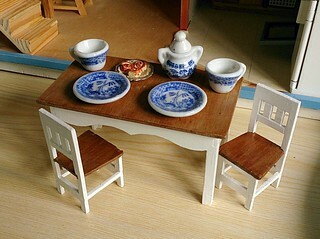 The full set of over 100 issues builds a large dolls house with fittings and furniture. Of these I kept flooring, hinges, doorknobs and stair parts – and found an unexpected bonus of dolls house plans included with later issues. The bathroom got a makeover: with Del Prado bath & wc, flooring and a smart new landing banister. Individual furniture issues were difficult to sell – there is much nicer ready-made furniture online– but I recovered my £20 outlay. 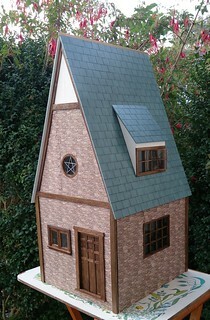 Leaving me with enough panels to build a very large dollshouse and, inspired by the Witches Cottage on ebay, I made this. 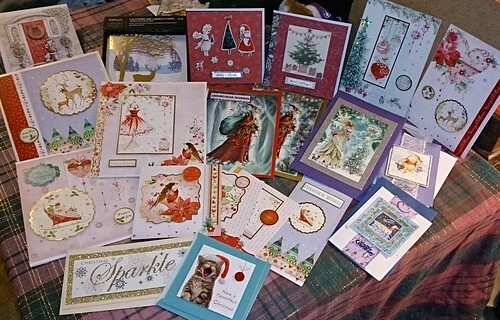 This is my Christmas card stash, an embarrassment of riches. Most are handmade from my Hunkydory windfall in November, a few from previous years, and a free box from WHSmith courtesy of O2 Priority. Thank you all – I love a freebie. We might have enough this year. 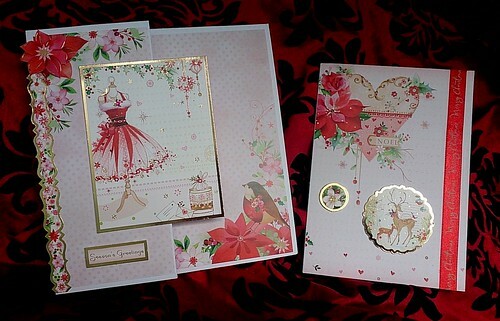 Remember I signed up to 5 issues of Cardmaking & Papercraft ? That went well ! I recovered my £5 outlay by selling 2 of the magazine gifts on ebay, so the paper stash to make this year’s Christmas cards was effectively free. And it is soo nice having the magazine delivered to my door. But frugal me cannot afford the full price subscription so I will be saving my Christmas cards again this year – ie those received- for upcycling. Pack of Stickies from The Works – can be ordered online for free delivery to your local store. Plain white card – Check thickness, should be ~240gsm. 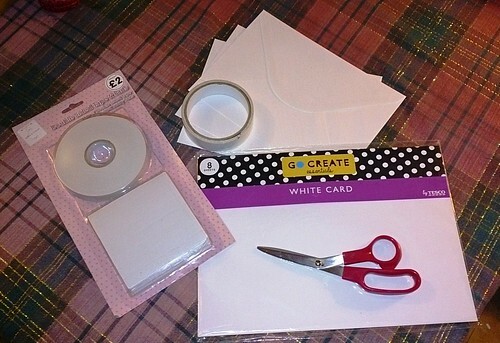 Envelopes – I get mine from ebay clearance lines. Scissors, a pencil & a sharp knife to score folds. A drawer to store all your bits in. The first 3 items can all be found at The Works, and I have listed other details in case you haven’t got a local store. 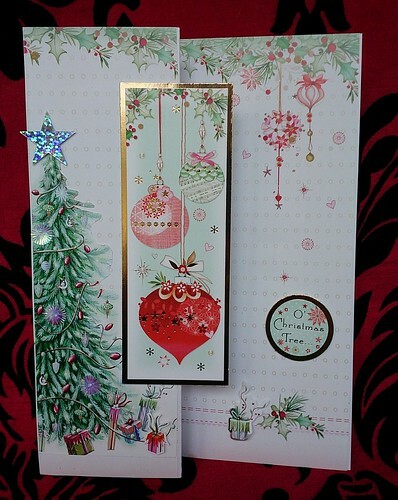 Look on ebay for topper sets or use the best bits saved from your Christmas cards. Get creative. How many cards do you send a year ? What do they really want ? This is the #2 way we save money at Christmas. Dear Santa…. Encourage everyone to post their wish lists on their Facebook profile page. It’s what Facebook Notes are for. Half my problem with Christmas is not knowing what to get DDs, so I used to buy 3 or 4 different presents as a substitute. Guess what? They were often irked I spent so much on stuff they didn’t particularly want. And vice versa. Works because: once you’ve got them what they want, relax. 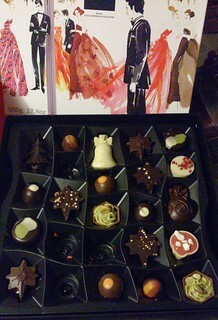 Last winter I won a Hotel Chocolat Wreath & Double Layer Selection box, and their chocolates are to die for. 😛 Whilst happy to share the Large Chocolate Wreath, I saved the Selection Box thinking to have one choc each day to brighten January – you can guess how that went. I am appalled that I didn’t take a pic until half the top layer was gone: I blame the poor lighting and getting to grips with a new camera they were delicious. And the box was so pretty: I hope I saved it somewhere. You might have noticed that I am operating on the proverbial shoestring- always up for ways to add value but only ever window-shopping. I rarely have money in my purse. 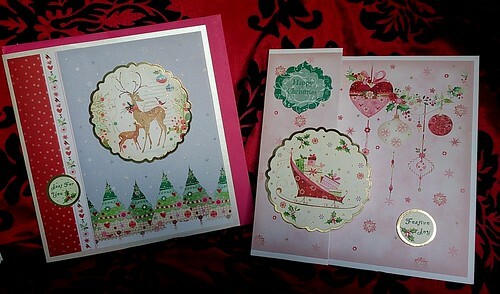 Last month though, I took the plunge and allowed myself a treat – £5 for 5 issues of Cardmaking & Papercraft magazine. Their free gift of Hunkydory paper and toppers last February kept me in birthday cards all year and I was/am hoping my 5th issue will have a similar free gift. But I didn’t have to wait that long! November’s issue (on the shelves still until 30 October) includes a generous Christmas stack and I have been busy already. An easy plain square, and a folded front. Oops! I left the pink envelope in. Another folded front, and an A5 card. I felt terribly guilty cutting the poinsetta from one of the toppers, but I couldn’t think of any other way to hide the top left corner where the edge strip was too short! I’m looking forward to making more cards over the next few weeks. What do you think ? What was your most recent treat, and was it a bargain? 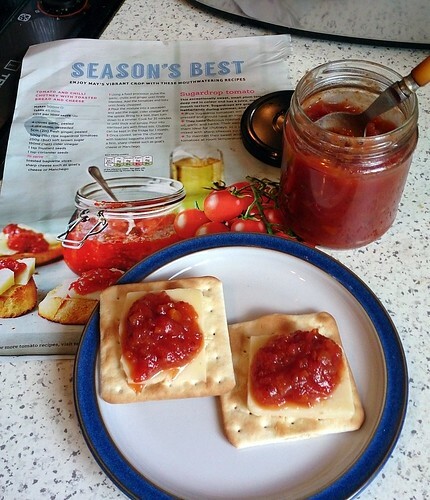 Tesco made a big mistake this week – they stopped stocking a tomato relish, otherwise known as hamburger relish. Too late I found where they had moved the salsa, because by then I had detemined to make my own. How hard can it be? Tin of tomatoes; tomato puree abt a third of a tube; 1 onion, minced; teaspoon of mustard seed; vinegar & sugar. The vinegar was leftover from a jar of pickled onions, and I added a fragment of pickled ginger; some crushed dried chilli; and the last spoonful of Sharwoods Szechuan sweet chilli sauce – all languishing in the fridge. Mince the onion, a manual mincer is fine for this. Put everything in the pan except the vinegar and sugar, and go easy on the chillies. Stir and heat to a slow simmer, then add vinegar & sugar & simmer gently til thick. Vinegar, sugar & sterilised jars will keep this for longer if you are making a bigger batch, but my 2 x 12oz jars are for immediate use and will keep in the fridge well enough. Alternatives – add courgette: twice as much as you have of onion, and call it chutney. Christmas is a season for me, not a one-day event but a whole season. If you don’t read all of this – and it looks like being 2 posts – just take away that one thought. Here are a few of my favourite things, festive traditions old & new. I love making Christmas cards from the best bits of previous ones. It embodies my principle of ‘keep the best bits, bin the trash’ which I freely apply to any part of my life. This year I put together some kid kits so my grandson could make his own -and his finished cards came out surprisingly well. Click through to flickr if you would like more details. My daughter wanted a red & white theme so I let her get on with it but oops, we forgot to cover the base until it was too late. 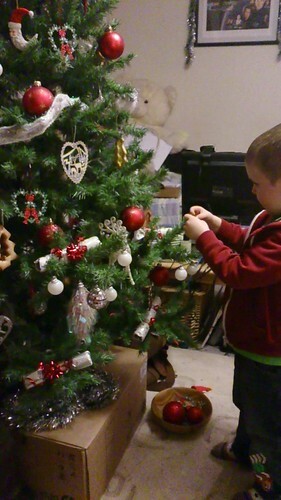 I’ve been banned from using tinsel in case it gets stuck to her gingerbread decorations, and the bead chains are proving too much temptation for the 3yr old. So ‘my’ tree looks a little different this year. We save our tree for next year – and the decorations, of which we have more than enough in four different colours, but we almost always buy new lights. 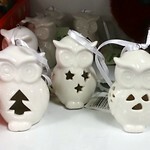 My treat is to buy just 3 of the best bauble that catches my eye – but this year’s candidate is £3 a pop. What have you been doing since …? Where do you want me …?